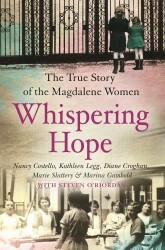 WHISPERING HOPE is the heart-wrenching story of five women who were confined in Magdalene Laundries in Ireland during the 1950s, 60s and 70s. The women are now between the ages of 56 and 79 and recount the harrowing physical and psychological abuse they endured in the institutions run by the state. In first-person accounts they reveal the shame and secrecy surrounding these desolate places. In 2011, a turning point occurred when the women joined the Magdalene Survivors Together charity, founded by documentary marker Steven O’Riordan. Here they were able to try and move forward by fighting for justice through their forged friendships. However their battle isn’t over yet; feeling misrepresented by the media, these five women are passionate about discussing the plight of women at the hands of the Catholic Church and ensuring their side of the battle is never forgotten. Exploring the social history of the women of Ireland, WHISPERING HOPE is a deeply moving account of survival, friendship and courage.